I cannot seem to find the time to compose an interesting or well-written blog post these days. The house seems to consume all of my time and attention, and when I'm not working on the house, I'm baking, then setting up photo shoots, then editing photos, and all my energy is spent with nothing left over for the writing. Our weekend disappeared in a haze of back-breaking work on the kitchen. After the counter installation last Friday, we spent all day Saturday putting up white subway tile backsplash, and then finished the grout work on Sunday. What an exhausting project. 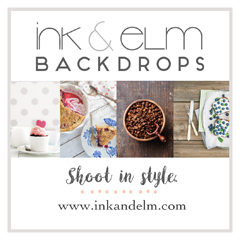 I have completely fallen in love with my "new" kitchen, and I can't wait to share photos of the changes we've made. It's not quite finished - there are a few more finishing touches needed. We need a microwave; and Jamie is still working on sanding and staining the walnut island top, so in the meantime, I prepared Easter dinner on a slab of spare drywall set over the top of the island, which worked quite well in the interim. Somehow, after all that work, and with my feet and shoulders aching beyond belief, I mustered up the energy to bake a ham in a sweet orange glaze, roast some carrots and potatoes, whip up a batch of cupcakes, and even bake homemade rosemary rolls. Because what is leftover ham without a soft bun and a spoonful of mustard for the most delectable mini sandwich? But now that it's been a week since my last post, I feel I can't wait any longer to share this recipe. So I hope you will forgive my lack of eloquence over this chocolate almond tart, but believe me when I tell you it is fantastic. 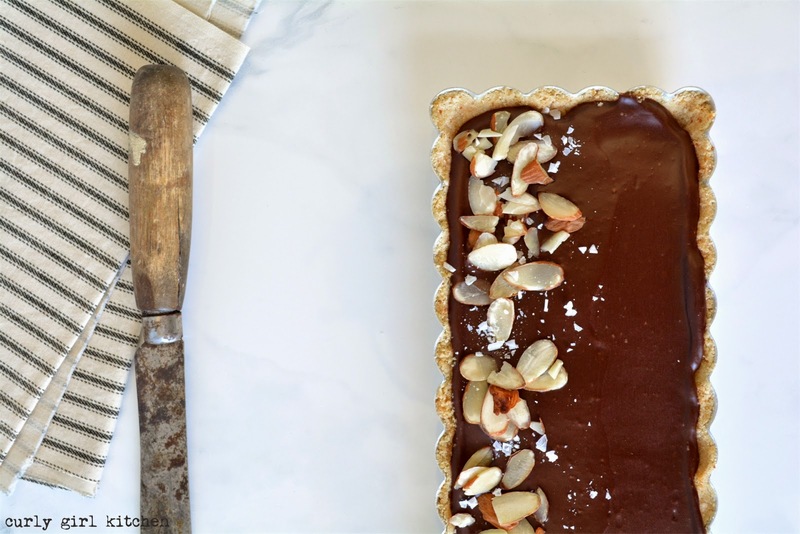 It's no secret I love any sweet thing baked with almonds, and this tart epitomizes my long-time love affair with almond pastries. 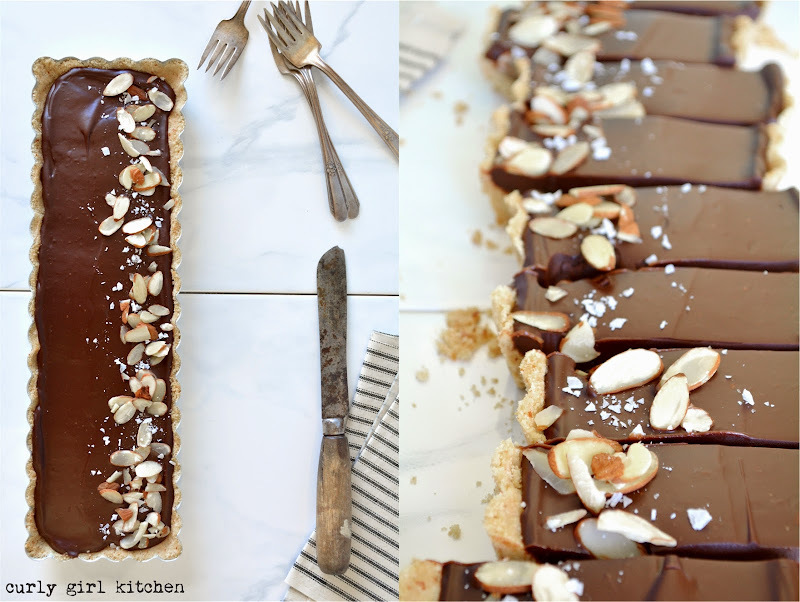 I had been promising Jamie a pie - so one Friday night when he went out to pick up sushi for dinner, I mixed up almond shortbread dough and baked it in my pretty French tart pan. 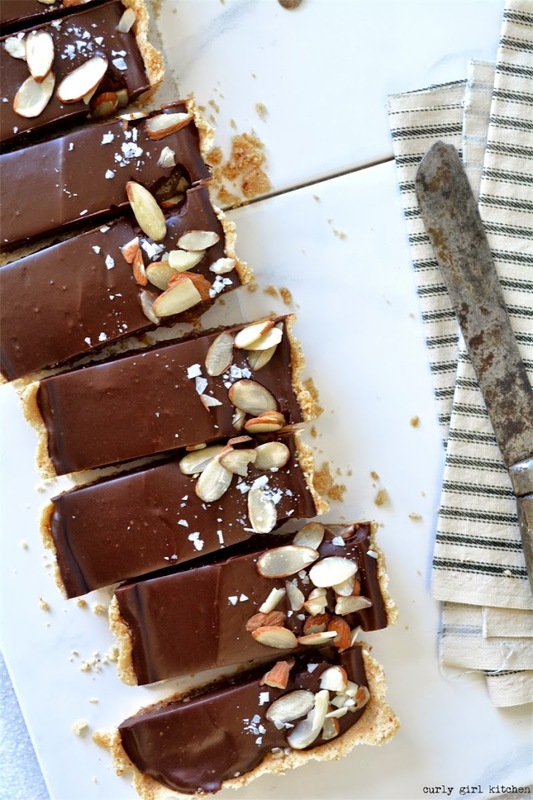 The tart may look complex, but it's actually fairly simple with very few ingredients. 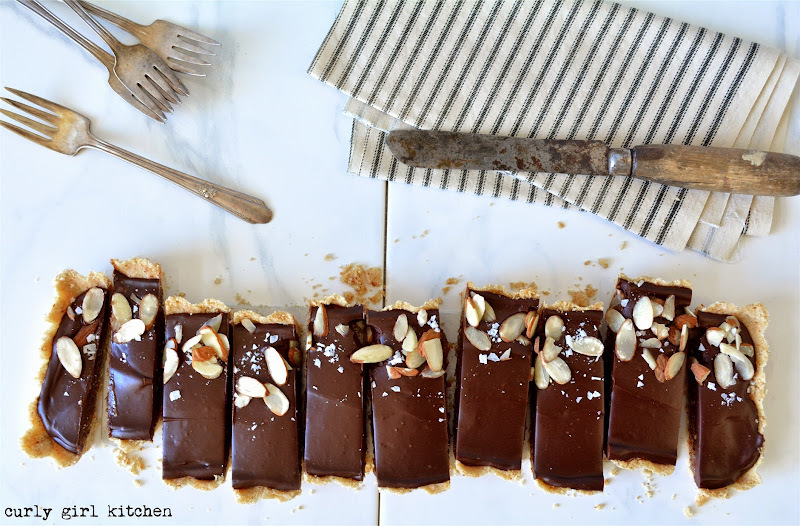 After baking, the crust is filled with almond pastry filling - available at most grocery stores - and topped with dark chocolate ganache, made with a 1-1 ratio of bittersweet chocolate and cream. 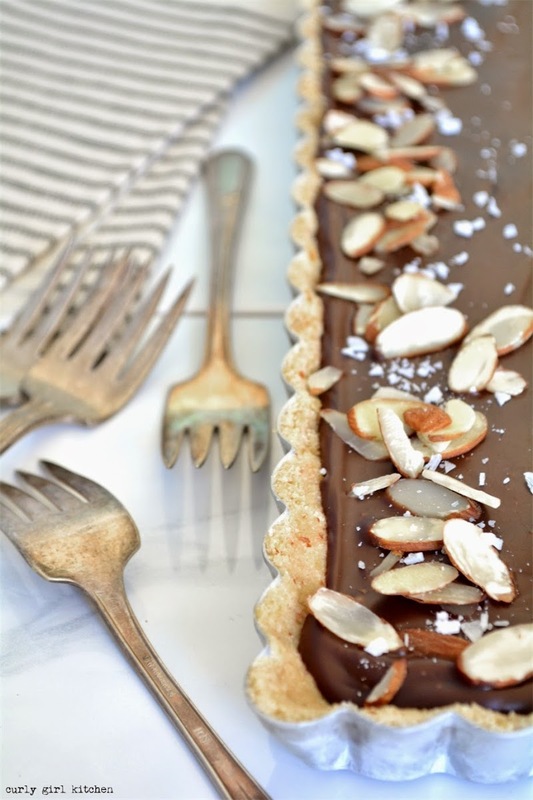 I finished the tart with sliced toasted almonds and coarse sea salt. And then, it just needs some time for the ganache to set, and the tart is ready to be served. In your food processor, combine the flour, sugar, almonds and salt until the almonds are finely ground. Add the butter, a few tablespoons at a time, and pulse to incorporate. Add the egg yolk, and pulse a few times until the mixture resembles moist cornmeal; stop processing before the dough comes together into a ball (if it does, then you'll have to roll it out instead). Preheat the oven to 350. Spray a piece of foil with non-stick spray and fit against the frozen dough. Fill with dried beans or pie weights. Bake for 25 minutes. Lift out the foil with the weights and bake, uncovered, for an additional 10-15 minutes until golden brown. Spoon the almond filling into the warm crust. In a saucepan, bring the cream to a gentle simmer over medium low heat. Finely chop the chocolate. Remove the cream from the heat, add the chocolate, and let stand for 3 minutes, then stir until smooth. Pour over the almond filling and smooth out the top. Sprinkle with the almonds and coarse salt. 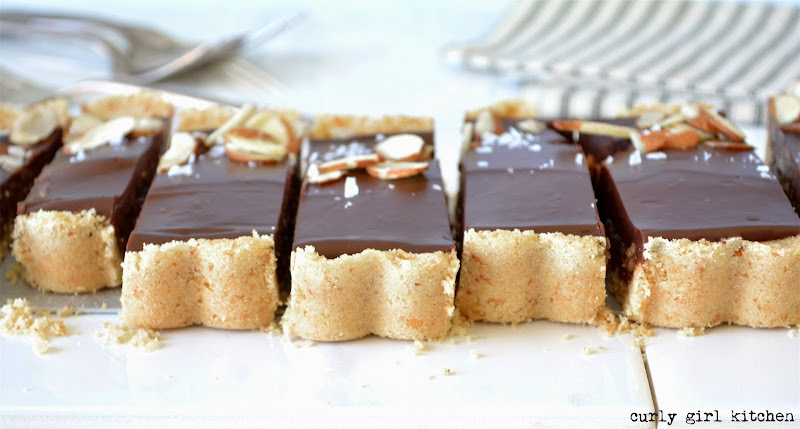 Let stand for several hours, or overnight, at room temperature, until the ganache is firm, then slice and serve. I completely understand how much work goes into each post and how it can been difficult to craft the story that goes along with it. 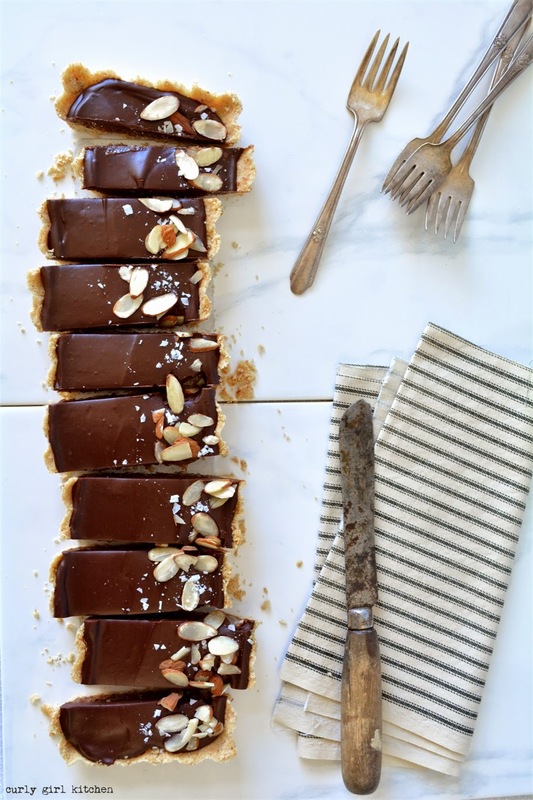 But sometimes it's okay to let the food stand on it's own and this chocolate tart is one of those show stopping recipes that can lead the post with few words. It's such a gorgeous dessert. Lynn, thank you, I really appreciate that! I miss the days when I spent so much time writing thoughtful stories about the food. Oh wow! 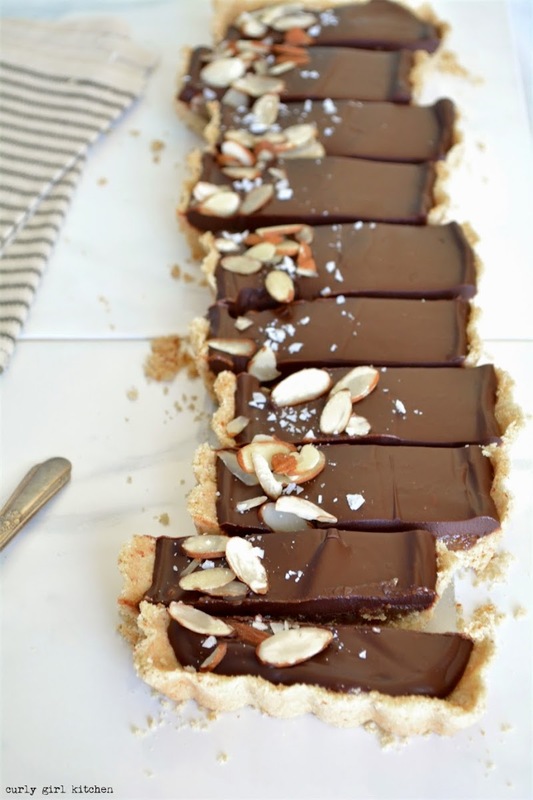 Chocolate almond tart looks AMAZING! Absolutely gorgeous! I definitely can relate to your thoughts about the writing part of things - i often feel more pressure to write something meaningful for my readers rather than let the food do all the talking and get really constrained by time too. 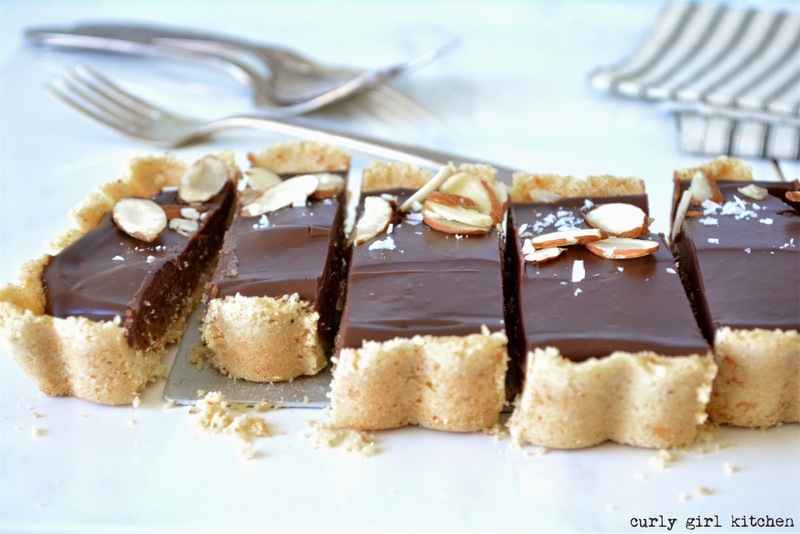 But this chocolate and almond tart speaks for itself - absolutely divine. I appreciate that, Thalia. Your posts are always beautifully written, and I can tell how much thought you put into them. Do you freeze the excess dough in a disk? Or do you press into the tart pan and freeze? Luisa, you could actually do either, but I just put the dough crumbs in a ziplock bag and froze them that way, so that later when I want to use them, I can just thaw them for a while and press them into a tart pan before I'm ready to bake it. I just bought two rectangular pans but now need a serving platter to accommodate these. Any ideas ? The size is a little tricky for serving. Sometimes I put it on a long wooden cutting board for a more rustic look, but I also have a plain white long platter that works. I just found rectangular platters that are the perfect size fort tart pans at Home Goods this week. They have several sizes so bring your measuring tape! White ceramic $5.99. Good to know! I love Home Goods. Hi, is almond pastry filling like marzipan? is it easy to find in grocery stores? They're different - almond pastry filling is more the consistency of jam and is not stiff like marzipan. Both should be available on the baking aisle of most major grocery stores.